Or read on to find out more about the plants themselves. 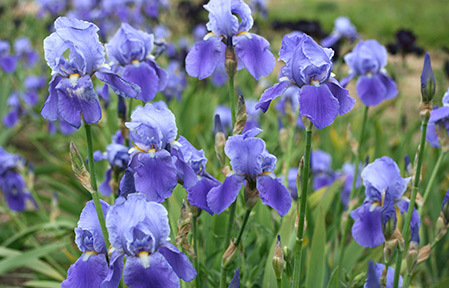 Bearded Irises are a particular passion for us; we now grow over 2.5 acres of plants. As well as collecting modern introductions – particularly the fabulous creations of the Schreiners nursery in Oregon and Cayeux Nursery in France, we also have a large collection of historic varieties dating from 1600 to 1960. Woottens Bearded Irises are despatched as bareroot divisions dug from our field from the beginning of August till the end of October. We also grow a wide range of Iris sibirica, some of which are pot grown and can be despatched throughout the year. In total we grow 20 different species of Iris including Iris spuria, Iris ensata, Iris reticulata and Iris chrysographes. Bearded Irises in the month of May are the keynote speakers in my garden – that sticky perfume and the intensity of colour of their flowers. No other genus has flowers so blue, so brown or so black; in these colours Bearded Irises rule supreme. A solitary Bearded Iris makes a sad sight; plant them in cohorts; there is great beauty in the repeated rhythm of their upright stems. Bearded Irises must enjoy full sun and sharp drainage. They disdain the miseries of shade and clay. Interplant Bearded Irises with plants with scanty foliage: alpine pinks, late flowering alliums…. 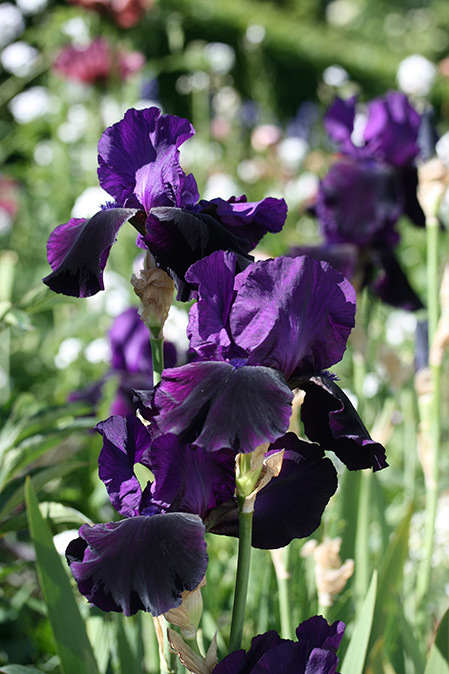 There are Bearded Irises to suit all tastes – from the classic and understated Iris Jane Philips to the strutting Vague A L Ame – all ruffled and laced. Our bearded Iris availability will show on our website between May and October. We count our Iris fields at the beginning of May and release that years availability after doing so. Between November and April bearded Irises will show as ‘out of stock’. If you wish to place an order during this time you can email us the varieties you’d like and we’ll process a provisional order. We cannot however guarantee your choices will be available until the availability is complete in May. Majority of our Irises are field grown and despatched as bareroot plants. If a plant is available as a potted variety the plant record will show a pot listing of either a 2litre pot or 1.3 litre for you to choose from. – We aim to despatch potted stock within 4 working days of the order being received. – We only despatch bareroot plants between August and October during our harvesting season. – Majority of orders placed before the end of July are despatched within the first 3 weeks of August. – Orders placed between August and October are despatched within 2 weeks of ordering. – We stop lifting Irises on 31st October. – These three months are the optimum season for lifting and planting so the plants put down good roots before the winter. Please note that payment for Iris orders is taken at the point of order processing. If we are unable to supply plants at the point of lifting we will refund you the cost of the plants we cannot supply. POSITION. Bearded Irises dislike being crowded in with other plants. They need an open position where they can feel the breeze. Poor air circulation, like sticky soil, leads to bacterial problems. To flower well, Bearded Irises need full sun for at least six hours a day. Gertrude Jekyll liked to grow Bearded Iris in rectangular beds set in stone paving. Plenty of air and plenty of sun and easy to keep weeded. Plant irises in large masses, and experience the ultimate in nasal ecstasy. SOIL PREPARATION. 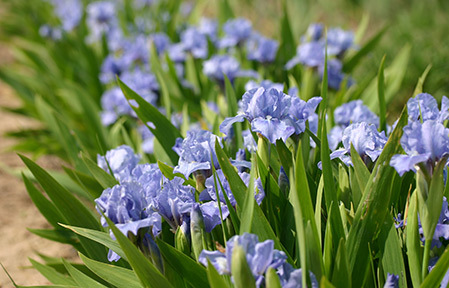 Bearded Irises are easy plants in well-drained soil. They dislike sticky clay soils, which greatly increase the likelihood of bacterial problems. They prefer the soil to be alkaline or neutral. Acid soil should be limed. If the soil is heavy and needs breaking up, dig in quantities of spent mushroom compost or garden compost. If drainage is very poor, raised beds may be worth consideration. Iris beds need careful preparation to ensure you have a weed free start. Perennial weeds such as creeping thistle, nettle or ground elder are extremely difficult to weed from between established Iris rhizomes. 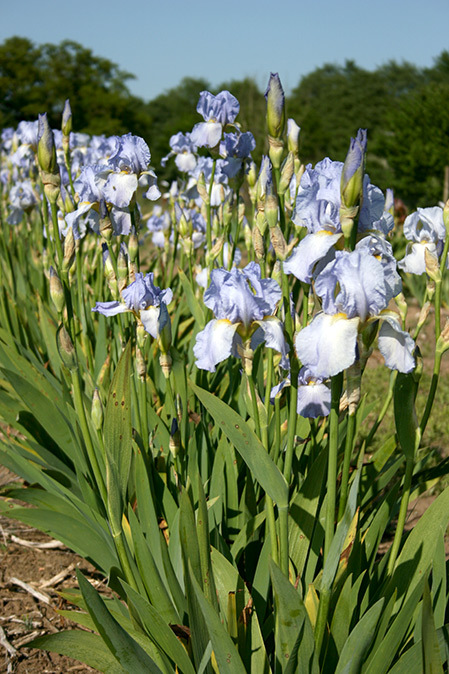 Irises do not like excessive nitrogen; never incorporate animal manure into a new bed. Make sure any preparation work is completed a month before planting, so the soil can settle.